Although Basotho are well able to read and write, most of them can be said to be rudimentary spatial data users, this because they are unable to read and interpret map data. Because this is the case, most Basotho are unable to participate adequately in discourse on spatial issues. Most are unable to understand the advent of climate change because interpreting it requires the use of spatial data. This spatial data in the country is at best expressed in 2-D. Issues around natural disaster evasion, town and country planning and others which rely on the use of spatial data to convey the message are also out of the realm of understanding for ordinary Basotho (who fall under the category of rudimentary spatial data users). The understanding and interpretation of spatial data in the country can therefore be said to be a problem. This means a very large proportion of Basotho are technically unable to contribute to the discourse requiring the understanding of spatial data. This essentially says when it comes to issues such as climate change and the town and country planning of the country; most Basotho do not and can not understand and therefore contribute adequately to solving the problem. In realising this, as a town and country planner in Lesotho I started contemplating how this can be changed and how more Basotho can be helped to better appreciate and use spatial data. Evidence of this was gathered by default in a survey done at Mohlakeng Community Council on farmer’s appreciation of the benefit of spatial planning to improve their agricultural activities and therefore their yields. The survey discovered that the farming communities in the sampled villages in Mohlakeng Community Council did not know of the impact of Town and Regional Planning on their farming activities. They did not, for instance, know of the benefit of embracing a land use shift in some of their farming plots to collectively grow farm feed for their underfed animals as a measure to improve their farming yields. The conclusion of the survey was that their needs to be better effort on the part of town and country planning to improve its tools for which people can better appreciate the process. I then came up with the idea of developing 3-D models of landscapes in the country. When created, these 3-D models can be used by different spatial data users for different purposes. Town and Country Planners can use it to engage the different communities where they work about the development intentions/interventions of the council/municipality where they are stationed. Geographers, environmentalists and GIS specialists can use it to engage Basotho about issues of weather, climate change and coping with natural disasters among other things. 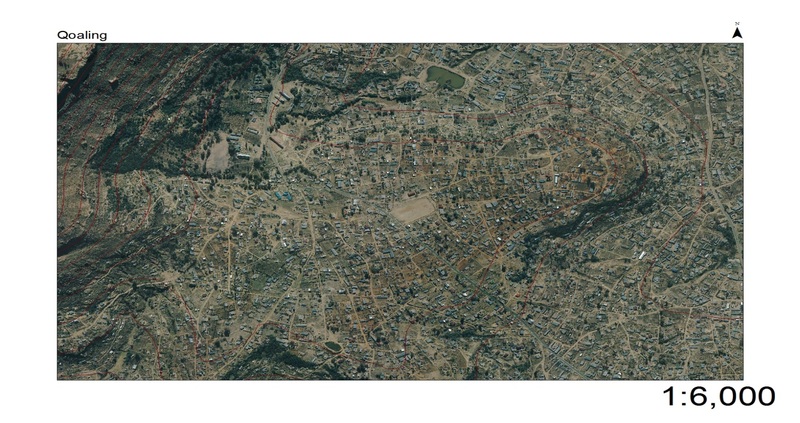 The process of developing 3-D models for Lesotho stems from the position of a town and country planner who came to the realisation that part of the problem of spatial development in the country is the inability of the major stakeholder in the discourse on town and country planning (the local community) understanding of spatial information whether on the ground or on maps or other 2-D interpretation of spatial data. This prototype shows a portion of Ha Motloheloa in Mohlakeng Community Council covering an area of about 0.5 km2. It represents all the features of the area in a format that is visually interesting and so can be understood better and more easily than the map version of the same area. Figure 1 and 2 show the map of the area and the developed prototype side by side. From the 2 figures it can be seen that it is easier to appreciate the information better when one can see the different elevations of the landscape and see the relative location of each of the features of the landscape as it relates to more than length and width but also to height. They are excellent for depicting landscape and features on the landscape but accuracy cannot be guaranteed. This is because once the contour lines have been represented; the model maker eyeballs the location of each feature on the landscape using a map of the area. The creation of large models covering big areas in close range is problematic and requires large manpower which can be costly. To improve on these developed prototypes and the potential efficiency of 3-D modelling in the country, a third prototype will need to be developed. 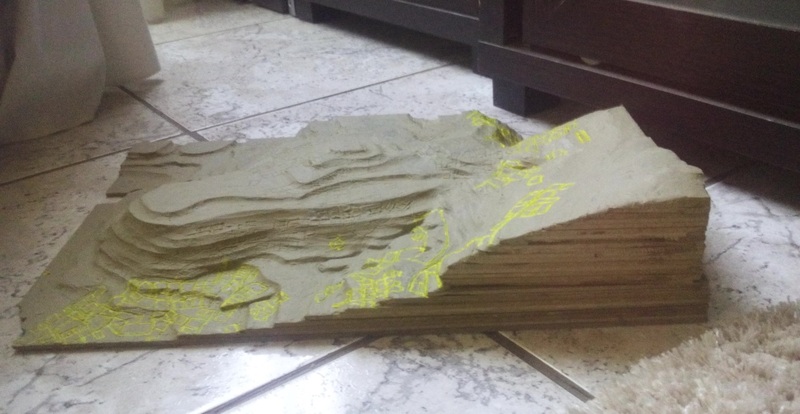 This prototype will be a 3-D print out of the landscape. This print out will be an up-to-scale version of landscapes. It will represent every aspect of the landscape accurately and this will counter the conceived drawbacks of the existing models. As it stands the capacity to procure a 3-D printer in the country or from the neighbouring country costs upwards of R60,000 ($4,615, Eur 3,530). This will be too expensive and probably a little inefficient as the device can only be tested after it has been bought. The ambitious plan to then build a 3-D printer came about. The printer will be built by computer science students in Lesotho who have the passion for gadget building. Together with this there is need to understand the use of mapping software that allows users to produce 3-D interpretations of landscape such that they become the output of the printer to be developed. Procuring open source specifications (specs) for a 3-D printer capable of printing landscape features. Gathering primary data on the potential impact that 3-D mapping can have on assisting ordinary Basotho to understand spatial information. Further steps will become clearer as progress is made on the above 3 steps.